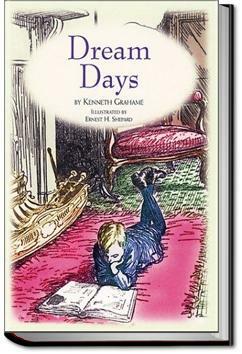 Dream Days is a collection of children’s fiction and reminiscences of childhood written by Kenneth Grahame. A sequel to Grahame’s collection The Golden Age. The book is best known for its inclusion of Grahame’s classic story The Reluctant Dragon. . . .There's bin another letter come to-day," Harold explained, "and the hamper got joggled about on the journey, and the presents worked down into the straw and all over the place. One of 'em turned up inside the cold duck. And that's why they weren't found at first. And Edward said, Thanks awfully!" I did not see Martha again until we were all re-assembled at tea-time, when she seemed red-eyed and strangely silent, neither scolding nor finding fault with anything. Instead, she was very kind and thoughtful with jams and things, feverishly pressing unwonted delicacies on us, who wanted little pressing enough. Then suddenly, when I was busiest, she disappeared; and Charlotte whispered me presently that she had heard her go to her room and lock herself in. This struck me as a funny sort of proceeding. Possibly only suitable for those who adore Edwardian childrens fiction, or who, like me, would read a press release for shoe polish if it were penned by Grahame. Bloody hell, this book is shiny! Some pieces are stronger than the other...I love "The Magic Ring", "A Saga of the Sea", "The Reluctant Dragon" and "A Departure". childhood vignettes - some are awfully close to my own memories. I will have to admit that this book was a bit of a disappointment - okay the binding and edition are amazing but what is what you would expect from a Folio edition - however the actual book itself was a bit of a disappointment. I read "A Wind in the Willows" last year, in my own late middle age, and was awed. It was like finding out there was this guy named Shakespeare who wrote plays—the work transcended a "star" rating.